The 4-pole M12 sensor cable EVT009 from ifm is temperature resistant up to 100 °C and therefore especially suited for difficult applications. 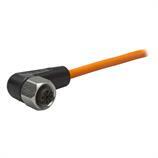 The EVT009 sensor cable consists of a 25 m PVC cable, an angled M12 socket and gold-plated contacts. The 3 operation and switching status indication LEDs are clearly visible even in bright lighting conditions. The M12 stainless steel coupling nut is secured against shock and vibration by saw tooth contoured vibration protection. Thanks to the high protection rating IP67/IP68/IP69K and the ECOLAB certificate, the silicone-free sensor cable EVT009 is ideally suited for hygienic and wet areas in the food industry.